Every few months I hear about different plus size events and I keep promising myself I'll go along. Of course with childcare it can be difficult. That's why I was really glad that the Curve Fashion Festival was announced so far in advance. It gave me the perfect excuse to get organised and go along! I thought I'd mention it on the blog as I wondered if anyone else was considering going along? I've read about the event on the website and it sounds brill. I'd love to meet anyone who's coming along. The event itself takes place in central Manchester on the 26th September. There are set to be a range of fashion shows, seminars and brands showcasing their goods - even Tess Holliday is popping along to give a speech or two! You can get different tickets depending on what you want to do for the day - which is a great idea! Personally I've gone for an all day ticket but each to their own so book what suits you! Although the Curve Fashion Festival is a new event I've heard nothing but good about any of the other events that have taken place over the last year or two. 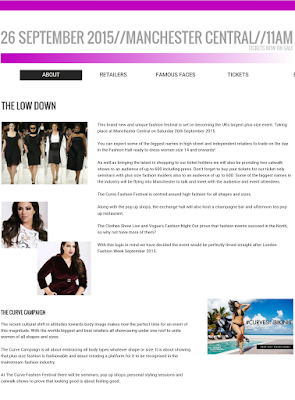 I'm really looking forward to seeing what the world of plus size fashion has to offer as well as meet a whole host of new bloggers! Will I see you there?